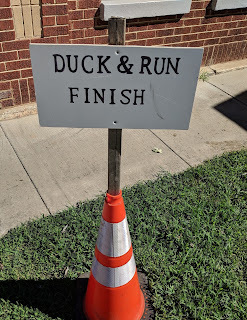 Duck and Run 5k Results! The Duck and Run 5k results are ready! First, thanks to all of the volunteers, sponsors, and the Athens Police Department. Today was a fast day with fast folks out front and the top 12 were all under 20 minutes. Our record for registrations is 295 and our record for finishers is about 263. Today, we had 292 registered and 254 finishers. Congrats and thanks everyone! The overall winner was Anthony Parameswaran with a finish time of 16:33. The ladies winner was Laura Bennett with a finish time of 20:05. The masters winner was Shane O'neill with a finish time of 19:14. The ladies masters winner was Joy Martin with a finish time of 23:17. Follow this link to the Overall Results. Follow this link to the Age Group Award Winners. The results are in! Thanks to all the runners and volunteers today. We had a beautiful, even if warm day for a race. Special thanks to Leigh Patterson, Lynne Hart, the Athens Police Department, and especially our sponsors. American Leakless helped us a ton with this year's race and we appreciate it. 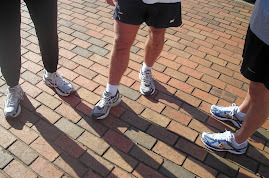 And as always, Fleet Feet Huntsville gave us generous support with prizes, advertising, and race day essentials. Also, special thanks are due to Mark Humphries for his work in preparing these results. He does a great job scoring this race for us every year. The overall winner was Beck Mitchell in 16:55. The women's winner was Betsy Walker in 22:10. The masters winner was Jim Clemens in 19:13. The women's masters winner was GL Wyu in 22:11. It's our 14th annual Duck and Run 5K. No gimmicks--just a well-run, certified, mildly challenging 5K on a beautiful and historic course. Saturday, September 16, 2017 at 8:00 AM at 125 East Street, Athens, AL. Pre-registration is $20, late and race-day registration is $25. Packet pickup on Thursday, September 14th from 4:00 p.m. to 7:00 p.m. at Fleet Feet Sports in Huntsviille and on Friday, September 15th from 4:00 p.m. to 7:00 p.m. at the KALB office at 125 East Street in Athens. Race Day Registration begins at 6:45 a.m. 5K begins at 8:00 a.m.
Pre-registration is $20, late and race-day registration is $25. Packet pickup to be determined at Fleet Feet Sports in Huntsviille and at the KALB office at 125 East Street in Athens.